It’s personal but it’s a good story…..my life as a Blogger. I know some of yon readers are a bit tired of my land-grabbing story but the truth is it did lead me here. And mine own self is a frequent contributor to the “Chicken Soup for the Soul” series, goodness I think this is about my dozenth printed copy. An editor somewhere classified my writing as “inspirational humor” and I go along with that. Yes, yon ladies and gems, I was born to be a Blogger. And while many good writers would eschew any attachment to the lawlessness of the world-wide web, I have since I had a Commodore 64 been in love with Blog type writer. A genre I would classify as a slang type of prose combined with pictures, a bit of sarcasm and sharp wit. Only they didn’t have Bloggers, Blogs or even an Internet as I grew up but you can believe I spent my life, no matter my job, no matter my marital status, doing little newsletters for my job or my family, complete with headers, columns, cute cartoons and glib prose. I still have every newsletter I’d ever written, including the Payola when I was working the payroll department and, of course, The Fishbowl, my monthly family newsletter I created, printed and snail-mailed out to all my family and friends. Then along came the Blog and as it is often advised to dance like nobody’s watching so I went on to write like nobody’s reading. And I write pretty good, I know that. I have written a couple of books, indeed, some of them quite successful. Blogging is my love, my joy….I must have twelve Blogs, all over the place. 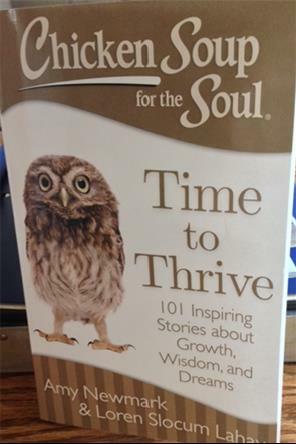 I do not receive any money on this latest Chicken Soup for the Soul book so do not rush to order to send me money. 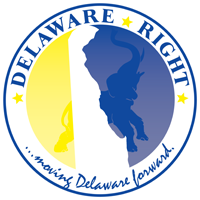 I am only putting this story on this Blog because it is a story of a Delawarean, of Delaware politics, of a Blogger who made a difference. I do get paid for my contribution, let me not mislead, and a bunch of free books. There will also, as soon as May, be some promotional events for this book to include Browseabout books and whatever other venues the publisher comes up with. The story deals extensively with Sussex county. I’d been living in Deerwood right outside of Georgetown proper for some 11 years when all of a sudden I got some kind of note from a builder of the Beaver Dam Estates behind me. Seems a whole bunch of folks from New Jersey moved in behind me and they all went out, for whatever absurd reason, and got brand new shiny surveys of their lots. Due to some weird juxtaposition of lot lines I had about five of the lots behind me hitting my back fence head on. The builder told me to please tear down my fence, about two feet or less is on his clients’ property. My husband had just died and this is a bit part of my story. Because I’d spent some three years taking care of him physically through bouts of pneumonia, bypasses and a horrible brain infection. So I was prime for lifestyle change and it didn’t seem very nice of those people to sic surveyors on me on the day of my husband’s funeral. 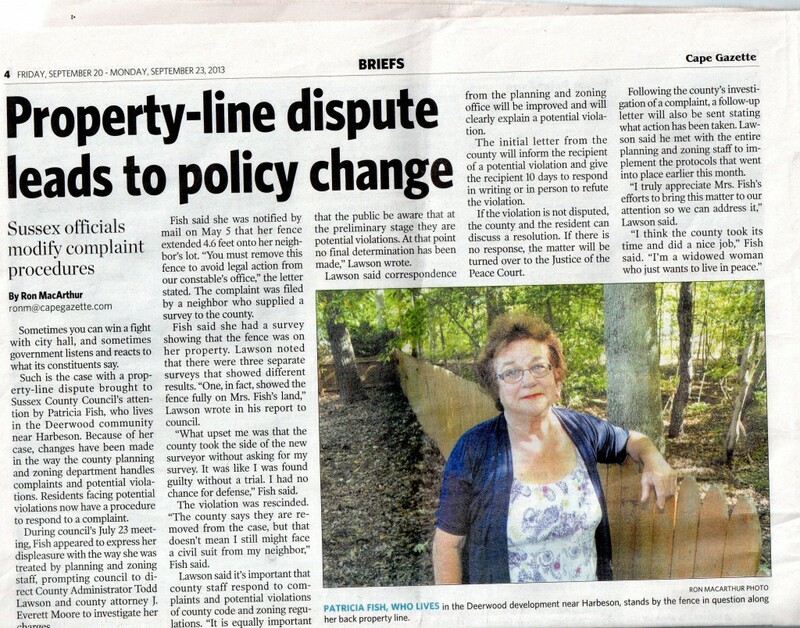 I was on my own without husband to guide but I pulled out my own survey done in 2003 and it very plainly showed my fence to be within my fence boundary lines. What evidently happened, as time passed and truth began to descend, is the guy who owned my lot owned a great big plot of land here in Deerwood. He had my lot subdivided specifically to build my house, which was his. I don’t know who did the sub-dividing but all of the other surveys showed my lot on their but hey, my survey was done in 2003 while theirs was done in 2013. You don’t get to just throw old ladies like me to the wolves cause you got a shinier new survey. Who knows why the lines were so wrong. Roadways shift, originally planned to curve here but changed and now curve there. Septic lots required 100 feet of length and my lot is EXACTLY 100 feet from my front road. Who knows, over in Beaver Dam they counted the hundred feet from their road and two of the feet appear to go beyond my fence line. So THEIR lots are not 100 feet from their fine, fine roads and this is my problem why? Well I gathered the materials, went to the Sussex county council. I spoke on the radio, I wrote my story, Ron McArthur of the Cape Gazette interviewed me. It went on to the dog barking law and on to local politics and now I am a regular Blogger still finding my way, still cutting my path. Sussex county did change its property boundary disputes procedures and if every one of those awful people behind me should drop dead I would not shed a tear. No hello, how you doing, nice to meet you….just tear down your fence. Now I write about politics though I’ve always been a news/political junkee. I especially love local politics and Blogging about events dynamically, as they occur or shortly thereafter. I’ve been offered Blogging spots on Redstate.com, know Captain Morrissey quite well, wrote for the Morton Report and yes all paid gigs. Blogging is the course of the future, it’s the little guy fighting and scrapping his way to attention. I’ve been a Blogger all my life, even when Blogging wasn’t cool. Will keep updated for future book signings. NEXT :Got a post of pictures and a Delaware tidbit coming up soon.